Today's outdoor mini-makeover post is one I've been working on for several weeks in between heat waves and thunder storms. 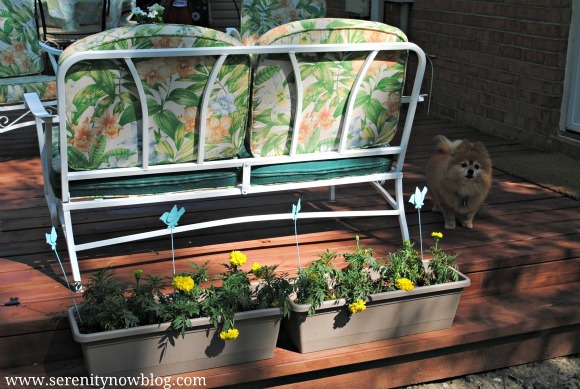 I shared how to clean and paint vintage metal patio furniture last month, and many of you mentioned wanting to see the rest of the lovely vintage aluminum patio set that came from my Nannie's house. 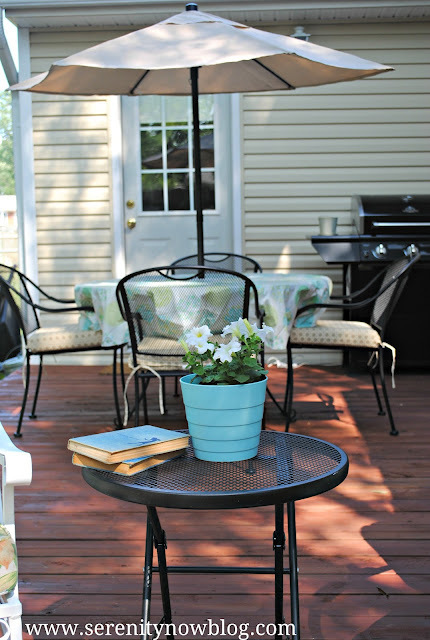 Krylon came to my rescue again with their fabulous Rust Protector Spray Paint, and my deck is sporting a fresh new look for summer! I was able to complete my spray paint makeovers in time for our little family 4th of July celebration. We're experiencing a heat wave and lots of storms in Virginia, so many of these photos were snapped late one afternoon when it wasn't (for once) storming or 500 degrees outside. 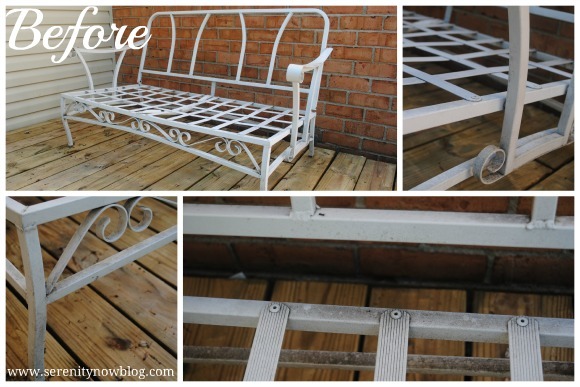 To clean and paint the remaining pieces of my set, I followed the steps in my patio furniture makeover tutorial...with the help of Krylon. I love that the Rust Protector spray paint dries in 8 minutes or less! A rain storm blew in not long after I finished the love seat, and I didn't have any problems with the finish. 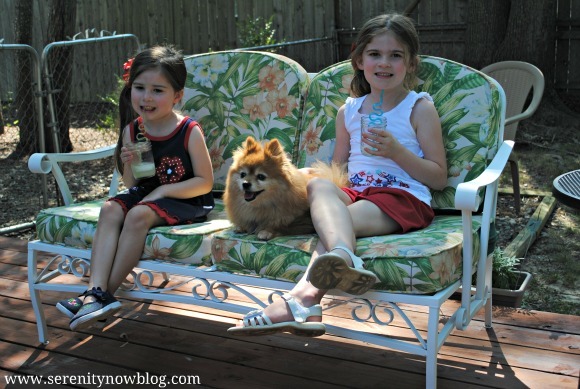 The love seat is perfect for relaxing with a pup...or a cousin. 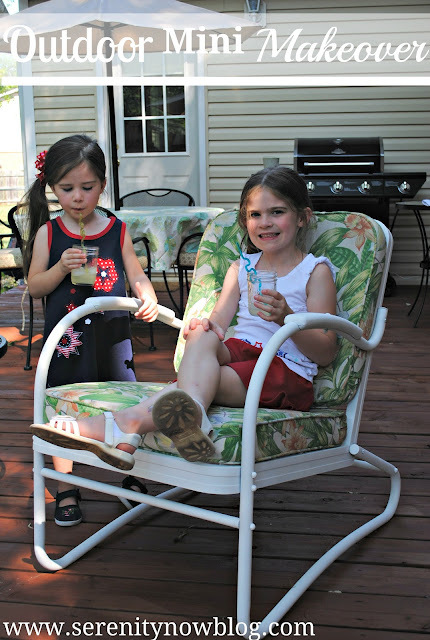 Anyone can enjoy a glass of lemonade in one of our "new" chairs. 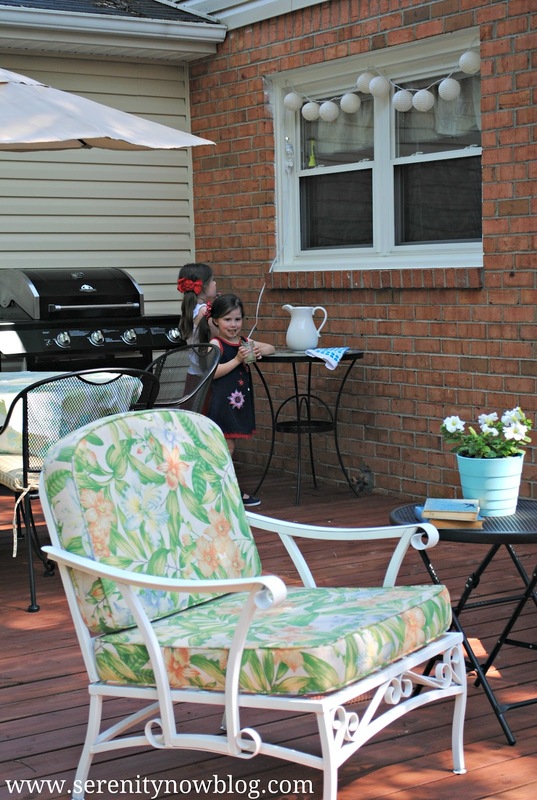 It's not fancy, but we are really enjoying our freshened up outdoor space! We didn't have any extra money to spend on outdoor rugs, extra furniture, or accessories after we stained the deck...so I used what I had, including the Blanche Devereaux-sunroom-cushions. All in all, I'm pleased! I like to show you guys simple projects like this because I know we're not the only family struggling in this economy. You don't have to spend a lot to create a homey, livable space! We still have some work to do, but I've learned that it's okay to go step by step and save for little extras along the way. I'm hoping we can build a potting bench to use as a buffet/drink station, and I'd also like to enlist T's help in making a screen to cover up the oh-so-attractive water meter and cable box. I think that will help a lot. I also have some good news for you! If spray paint projects are in the works for you, you can show off your work and enter to win a prize with the Krylon Make it Gr8 in 8 Contest! Just upload a quick 8 minute fix to the gallery, including the instructions and a list of supplies. Weekly winners will receive a 6-pack of Krylon Rust Protector, and the Grand Prize Winner will receive a riding lawn mower, a patio set, and a gas grill! If you enjoyed this post or found it helpful, I hope you'll click your "Pin It" button to add this project to Pinterest, or a +1 for Google+. *I received spray paint from Krylon for this project, but I was not compensated financially. Opinions are, as always, my own. it looks really good! The cushions are not bad at all, they look clean and comfortable. How many cans of spray paint did you need? 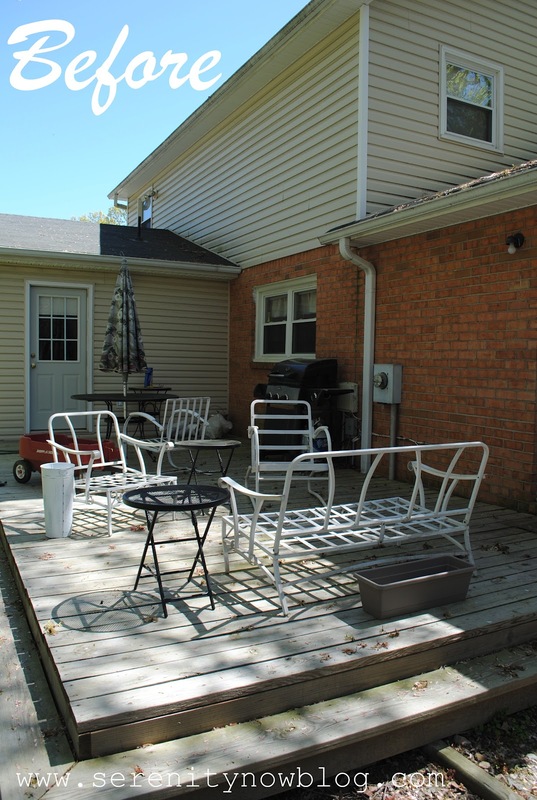 I need to re-do my patio furniture and we have an outdoor swing my in-laws gave us to paint too. And your girls are naturals in front of the camera, so sweet! I miss those days as mine is now a pouty eye rolling 11 year old and those sweet photo ops are few and far between. Great transformation! I love the older iron furniture. My MIL has some similar. The girls are obviously enjoying the new space. I stopped sharing pictures of anything I did around my house, because everything I do is definitely done on a budget, and I feel like my efforts (and house) pale in comparison to a lot of the stuff I see in blogland. I often felt like it was a competition, which is a part of the reason I stopped reading so many home decorating blogs - I always felt so inadequate! Painting the furniture makes such a difference. 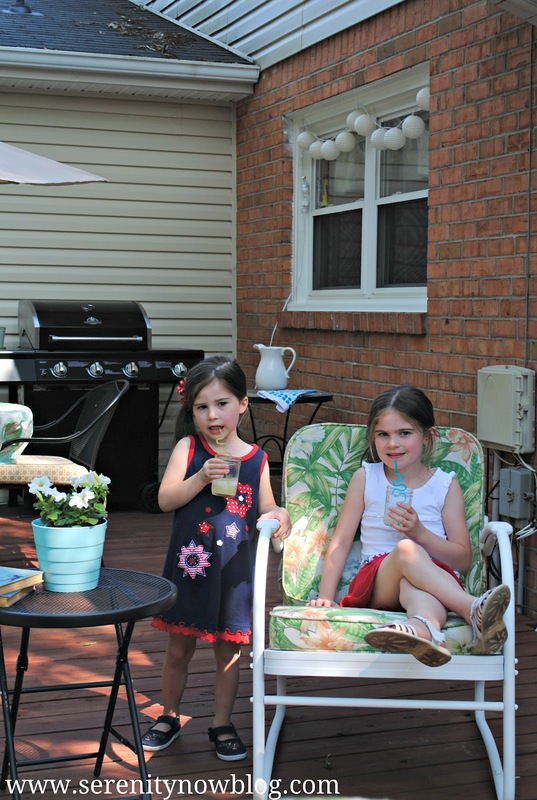 Your patio looks like a great place to entertain, relax, or have some family time. Hi Amanda! It looks so pretty and fresh. I like the Blanche Devereaux chair cushions...kinda retro which is the totally in thing right now anyway. :) We have a screened in porch that we got the nasty carpet pulled up, the glue sanded off the floor, and then it turned 100 degrees...you inspired me to get going on that again since the heat broke a bit. Amanda, I think it looks wonderful! Your cushions may be Blanche-era, but they still look pretty, especially on the white furniture. It's shocking, really, how much new cushions cost. 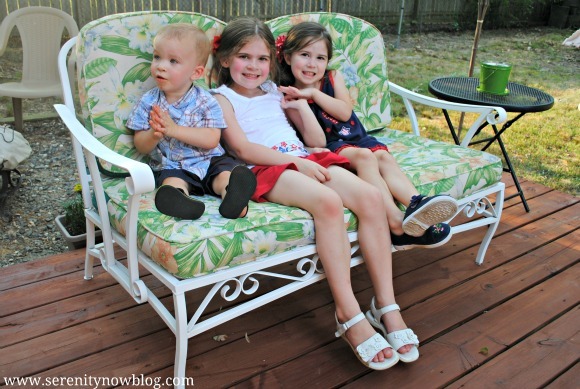 I looked at some when I was re-doing my front porch this spring, and I was flabbergasted! I would highly recommend keeping those same cushions and having new covers made whenever you are ready to change covers. At least I found that to be a much less expensive option. 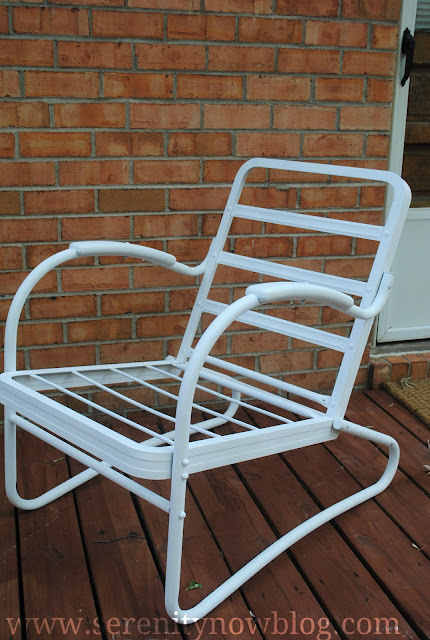 However, you might also want to check out Vivienne (The V Spot)'s post about her patio furniture. She just wraps them with fabric and hot-glues "seams" on the underside. I think they look awesome. I can also imagine that your furniture would look great painted black with cushions covered with drop cloth fabric. You could then add colorful throw pillows. I appreciate your posting about small projects. That's pretty much all I'm doing in our house these days. We are so blessed to be able to visit Rome to see Will, but a trip like this is expensive even when being economical. I think most of us can't afford to do multiple big things, and I'm sure there are many readers who are just barely getting by. I am grateful to you for being bold and speaking up about this! I love "real people" projects like this, something anyone can do to make what they already have better. Your patio furniture looks great- I love it! Our deck desperately needs to be cleaned and repaired and restained- how do you work in this heat?!! I think it looks great! I kind of like the vintage cushions...they totally make me think of the Golden Girls:) I really like the lights hanging in your window seal too. 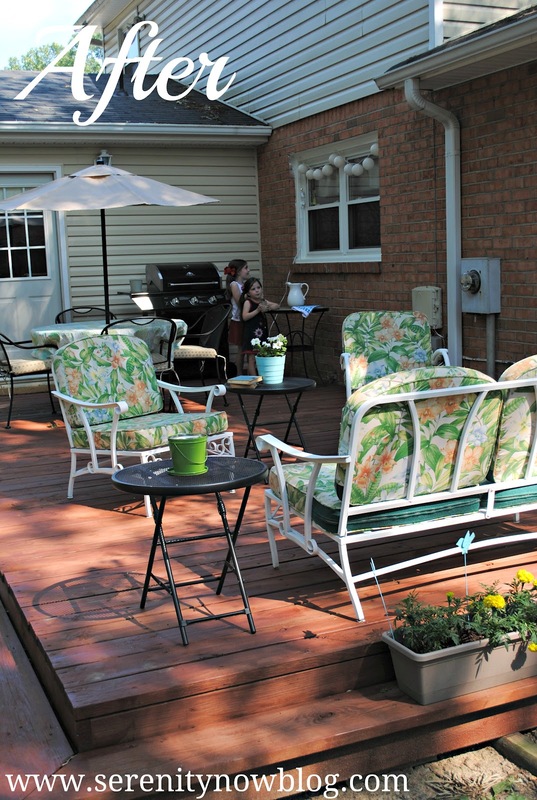 Great makeover - I really need to update my patio and furniture. Thanks for the motivation! I LOVE before and afters. The deck looks great! What a nice little update. I love rustoleum paint. I use it on just about everything! What a lovely outdoor space. I hope the heat and storms let up soon so you can get out there and enjoy it. We've barely set foot in our backyard in a couple weeks, after spending the whole spring getting it whipped into shape. I'm such a wuss about the heat. It looks fantastic! Thank you for giving me the inspiration to do something about the rusted, glass-topped coffee table from our old patio set. I didn't want to get rid of it, because it's very handy, but it looks so icky. I'm going to follow your steps for cleaning and prepping it, then will break out the Krylon! Looking GOOD! Nothing like a freshened up patio set. 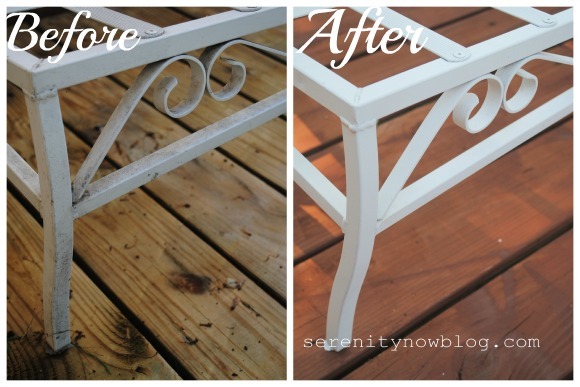 Gotta love spray paint =) I have to do mine every season and I am always pleased at the difference it makes! Spray paint can be so refreshing! Everything looks nice. Okay, am I a total DORK that I was thinking Blanche Devereaux was referring to some fancy-schmancy new fabric designer until it dawned on me the reference you were making? LOL! LOVE how this space turned out, Amanda! It is so gratifying to take what you already have and make it special. Amanda the deck looks fantastic! I love the new stain & the patio furniture turned out great! I love the clean lines of the chairs & the cushions even look comfy! :-) Your family will have lots of days to enjoy out there. everything looks so inviting. so crisp. 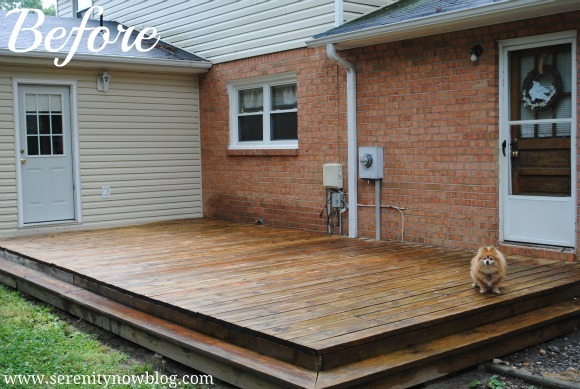 you have done an amazing job from one girl who knows what it's like to overhaul an outdoor space. and in this heat! oh my! It looks awesome! Lots of seating is perfect! And the girls look like they love it out there! Hi Amanda: I love your deck transformation--the bright white of the patio set is so pretty with those seat cushions, and I like the black side tables--so handy for your books and drinks! Looks like it's a hit with the kids, too. Take care, and have a wonderful week! I love what a little spray paint can do! The updated deck looks fabulous! Bravo to your awesome makeover! Those furniture are great! They all look like new tables and chairs!